Contact information can be found under the members center. Karen J. Schneider, Manager, EHS Federal, State, Canada Full-Text, Bloomberg BNA, Hostess of breaks and Friday dinner. Post your “Who’s who and what’s new” items on this page by responding to this post. 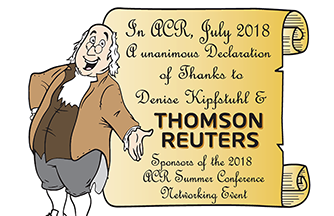 Posted in Conferences/Meetings | Tagged ACR members, Washington D.C.
Rule Writers’ Consortium – After years of hiatus, the group is being re-formed. We’re lucky enough to have had no staff changes these past several years. We’ve had a lot of administrative rule filings since our legislative session ended in July. We even had a record set – largest Oregon Bulletin ever at 808 pages! Our Bulletins are full text and usually run around 300-350 pages. But the February 2014 Bulletin had all the administrative rule updates required by the January 1 deadline set by the Legislature – and they must have required much more than usual – to end up with a whopping 808 pages, which we posted on-line on Monday, February 3 – Whew! This month we hit the one year anniversary of requiring all Administrative Rulemaking notices, Permanents and Emergency rules be filed using our on-line filing system. This has been a great change for us, and has met little resistance from the rules coordinator – many have embraced it. We’ve had a lot of turn-over in the position of agency rules coordinator lately, with just about half of our 180 agency rules coordinators new over the past 24 months, so we’ve been doing a lot more with rules coordinator training – both one-on-one overviews here in our offices, and expanded all-day administrative rule trainings conducted jointly with Dept. of Justice attorneys. I wish I was there with you. I’m looking forward to seeing all of you in July in Baltimore. 2 big things in Wisconsin. 1. Elimination of paper of pubication of Admin Code and Register January 2015. In process of upgrading the web presentation of the Register and improving system for notices of changes and to the code and individual Regsiter itmes through enhanced RSS feeds and a corresponding email system. Greetings from Washington – home of the 2014 Superbowl Champion Seahawks! • Currently I’m researching different survey programs to see if we can find one that will not only be easy to use; but will be easy to update information each survey cycle. • Hopefully we will either have a new program in place to use this year; or we will use the current program. • It is my hope to gather all the information and have a bound survey by the July convention. • Governor Gregoire‘s executive order suspending non‐critical rule making has expired. There is talk of another executive order being considered by Governor Inslee’s office, but nothing has materialized yet. • Authentication of electronic legal documents is an issue of importance. Since the passage of the Uniform Electronic Legal Material Act, we have been actively reviewing different possibilities of authentication. • We have moved to a new authoring system called oXygen. We have completely converted the entire WAC data base which contains over 54,000 sections and which encompasses 16 volumes of printed material. We are currently publishing those 16 volumes and it is slow going. Next year should be a lot easier. The Uniform Electronic Legal Material Act, effective March 31, 2014, impacts the Code of Colorado Regulations and Colorado Register as official electronic publications. Our authentication solution will be a digital signature applied to a PDF/A document. System Enhancement Project – to improve our existing all-electronic filing system that was implemented in 2006 and convert the publication from paragraph-based to document-based. – Mandatory Review Of State Agency Rules – SB 14-063 would codify and expand upon an existing executive order requiring each agency to periodically review its rules. – Regulatory Reform Act 2014 – HB 14-1033 concerns state agency requirements for the enforcement of new regulatory requirements on small businesses. – HB 14-1194 to Recreate the Legislative Digital Policy Advisory Committee – to develop plans for the digitization of archived legislative recordings, make recommendations regarding implementation of the UELMA, and make recommendations for an optimal method of records creation, storage, and access for other state electronic records. Hello from Montana. I would love to be in D.C. right now. ARM Division once again finds itself without a division bureau chief; Audrey Dufrechou recently left us for a job as elections supervisor. The administrative rules bureau chief is a position appointed by the Secretary of State. Meanwhile, the editor and assistant editor continue to publish our twice-monthly registers, which average 100 pages per issue. Registers are published in paper, html, and PDF formats. Our rule updates are published quarterly and are in the form of replacement pages in three-ring binders. These quarterly updates average 800 pages. Our records management division requires microfilm as our official means of archiving. Our IT department was positioned to develop in-house a new electronic filing system. Due to a sudden large turnover in IT staff, the project has been put on hold indefinitely. Until that happens, the paper version will continue to be the official version of the Administrative Rules of Montana. Cancellations to paper subscriptions continue to outpace new subscribers. Currently, we have 86 register subscribers, 57 ARM full-set subscribers, and 280 single title subscribers. Legislative Services Division has been dinging a lot of agencies recently for their lacking fee statements. When a fee is being raised, lowered, introduced, or eliminated, agencies must publish in their rulemaking notice a brief statement that includes the amount of revenue change and the number of people affected. New this year is the small business impact statement wherein agencies are required to publish in their notices whether their proposed rulemaking will impact small businesses. This requirement sunsets after two years. I look forward to seeing you all next summer.